Today Yadavs constitutes 20% of India’s population and over 3% of world population-in terms of sheer numbers this translate to 20 crores or 200 millions. Yadav’s are the largest race in the history of the whole world. Out of 223 countries in whole world, there are only 4 countries including India with over 200 million population. It has been truly said that yadav’s are not merely a community but a “nation” in themselves. The Supreme Personality of Godhead is the source of everything. There is no one neither equal to Him nor greater than Him. He expands Himself as Maha Vishnu. When Maha Vishnu exhales then unlimited universes are created from the pours of His body and when He inhales then all the Universes are destroyed. Maha Vishnu exhales and inhales once at every one lifetime of a Bramha (100 years of Bramha ji= 311 trillion 40 billion earthly years). Bramha ji life consists of 100 years. 12 hours of Bramha ji consists of 4 billion 320 million earthly years. Then Maha Visnu’s expansion is Garbodakshayi Vishnu. Garbodakshayi Vishnu’s expansion is Ksirodakshayi Vishnu. Lord Bramha is born from the Lotus flower which sprouted from the navel of Garbodakshayi Vishnu. When we speak of Hindu concept of trinity of Bramha, Vishnu and Mahesh- the Vishnu referred here indicates Garbodakshayi Vishnu, who is an expansion of expansion of Shri Krishna. Bramha ji from his consciousness or mind created many sons including Lord Siva, Narada Muni, Four Kumaras, Bhrigu Muni, Kratu, Pulaha, Vasistha, Angira, Pulastya, Marichi and Atri. 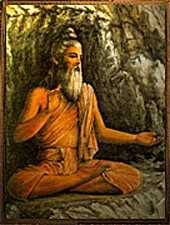 Marichi produced Kashyap from his dhyan or prayers. Bramhaji was not pleased by the rate of slow growth of mankind. Thereby, he ordered his son Prajapati to marry Aditi. This new pair gave us Vivashwan or Surya. Later, the love between Surya and Surenu gave us Suryavanshi Manu. 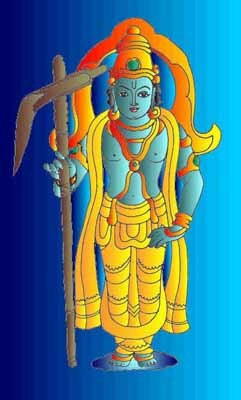 In Suryavansha, Lord Shri Rama appeared in Treta Yuga. Som (the Moon God) was born from Atri and Atri was born from Bramha’s mind. So all Yadav’s are Somvanshi or Chandravanshi. From the start of Somvansh/Chandravansh to Shree Krishna, there were 46 generations of kings, all listed below. The dates etc. are discussed at end of generation 46, i.e. Shree Krishna's. In Sata Yuga a person’s maximum life span was 100,000 years. In Treta Yujga a person’s maximum life span was 10,000 years. In Dvapar Yuga a person’s maximum life span was 1,000 years. In Kali yuga a person’s maximum life span is around 100 years. Sata Yuga lasted for 17,28,000 years. Treta Yuga lasted for 12,96,000 years. Dvapar Yuga lasted for 8,64,000 years and Kali Yuga will last for 4,32,000 years. The moment Lord Krishna finished His lila on this earth planet, Dvapara yug ended and Kali Yuga started. So around 5,100 years of Kaliyuga have passed and there is more 4,26,900 years of Kali Yuga is remaining . After the end of Kali yuga again Sata yuga will start. According to Bhagavat, son of Som and grandson of Atri, Rishi Buddh came to Bharat-khand for offering prayers and relieves his remorse. Suryavanshi Manu's daughter Ila fell in love with Buddh. They together conceived a son named Pururuva. Later, he became a chakravarti samrat or a great king. The Pururuva dynasty was called "Yela", derived from mother, Ila. Pururuva established the city of Prayag which later became the capital of his kingdom. Prayag was later named after him and till date it is refered as Yelahabad (Allahabad-Muslims started pronouncing like this in later centuries). During the times of King Pururuva, King Indra's enemy Danavraj Keshi used to rule Hiranyapur. King Pururuva helped Indra in defeating Keshi. Indra, in courtesy, offered Pururuva an apsara, called Urvashi, as a gift. 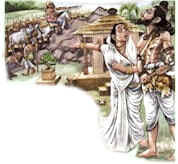 This pair gave birth to six sons, eldest being Ayu, followed by Amavasu, Visvasu, Ritayu, Satayu and Ayutuyu. 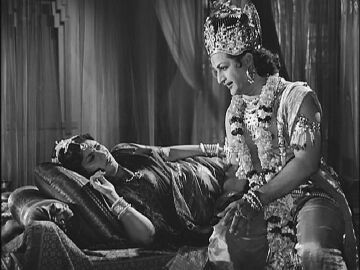 After sixty years of being together with Pururuva, Urvashi returned to the heavens. The Ichwaku and Ela Arya were essentially the two branches of Suryavansh and Somvansh who established the mid regions of Kaushalya (Ayodhya), Pryag, Mathura, Kashi and Kanyakubj. Manu's Ichwaku built Ayodhya, Pururuva's eldest son Ayu, built Mathura while the youngest, Amavasu, built Kanyakubj. Finally, Pururuva's grandson built Kashi. King Ayu married King Sarvbhanu's (Rahu) daughter Prabha. Yuvraj Nahush was their eldest son. Kshtravardh, Rambh, Rajji and Adena were their other four sons. As mentioned before, King Ayu established the city of Mathura on the banks of Yamuna River. In times to come, Prayag was considered to be the Yadav's mainland and Mathura was the capital for many generations during their rule. The Tartars from Mid-Asia considered Ayu to be their forefather. In their local language "Ayu" was considered plural of Chandrama (moon) and was considered a symbolic representation of God. 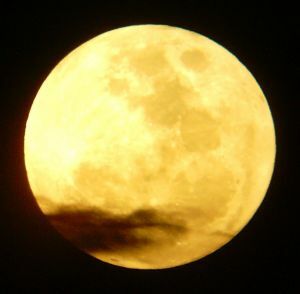 Tartar's "Ayu", Chineese "Yu" and Puranas' "Ayu" are all synonyms of Indu or Chandrama (moon). New castes kept emerging and Ayus kept fading as the time Yadav progressed. The prince of King Ayu. He married queen Vraja. They had six sons, Princes Yati, Yayati, Samati, Ayati, Viyati and Kriti along with a Princess, Ruchi, who later married Aapnavan- the son of Chayavan rishi and Sukanya. In the 10th war with Devasurs, King Indra killed the Trishira bramhin. He was condemned for killing a bramhin and as a result, Indra escaped heaven and took hiding in an unknown place. During his absence, the kings of heaven chose King Nahush to take care of their kingdom. Unfortunately, one day, King Nahush got attracted towards Indra's queen, Sachi ( Indrani ) and in a rush to reach her, ordered the Bramhins to take his paliki to Sachi. This request infuriated the bramhins since they cursed the King and got him removed from his position as a King of heaven. The eldest Prince of King Nahush. The eldest son of Nahus, Yati was very religious by nature. He forgoed his birthright to rule the kingdom by his pure will and opted for bhakti instead. The second son of Nahush, Yayati became the king in place of Yati. King Yayati had two wives. One was Devyani, the daughter of Danav guru, Sukracharya and the other was Sharmishtha, the daughter of Danav King. Devyani was the mother of Princes Yadu and Turvasu whereas Sharmishta was the mother of Druhu, Anu and Puru. All of the Princes earned good names and fame during time of Rig Veda and were jointly called as Panchjanya. King Yayati, in order to please his senses ordered Yadu to exchange his youth with him. Yadu and the other three sons refused their father's request except the youngest son, Puru. Rishi Ushna Bhargav, using the youth sciences transformed the youth of a son into a father and vice-versa. King Yayati, unpleased with Yadu, took away his birthright to rule and gave it to Prince Puru instead. Prince Puru was married to Princess Pausthi. Before the youth exchange with his father, his sons were called Pauravs. The Paurav dynasty was carried forward by Kuru and the Kuru descendants, Kaurav and Pandav, carried forward Kuru dynasty. On the other hand, Yadu's dynasty was called "Yaduvanshi". 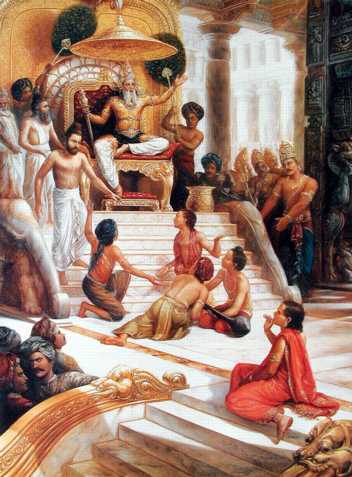 King Yayati distributed his kingdom amongst his five sons. Prince Puru received the great Prayag, the capital, situated between southern regions of Ganges and Yamuna; Prince Yadu received the south western teritories which included Charmvati (chambal ), Vetravati ( Betva ) and Shuktimati ( Keyn ). Prince Druhu received western regions of Yamuna; Prince Anu got the city of Kanyakubj and Prince Turvasu received the south eastern teritories of Riva. The Druhu and Anu dynasty captured Punjab and North-Western frontier states as well in later times. However, they just did not stop here and continued their expansion into west, outside the Bharatvarsh. This resulted in their gradual disappearance from Bharat itself. However, they carried Bharat's culture, civilization and customs into western countries. The Baktryiya Yunani who were also known as 'Yavan', were Anu's dynasty. Later on, the Turvasu dynasty also drifted from Bharatvarsh. Only Yadu and Puru dynasty remained in Bharat and completely transformed the face of Bharatvarsh in time to come. Yadu and Puru dynasty remained the central point of source of Bharat Varshs history. King Puru was great grandfather of King Dushyant and had a son named Bharat. It is from Bharat that the country got its name and came to be known as Bharatvarsh. King Kuru was born during King Puru's time, whose offspring’s were Kaurav and Pandav. These were the same renowned Kaurav and Pandavs who fought the epic battle of Mahabharat. The dynasty of king Yadu - Andhak, Vrasni and Bhoj, under the leadership of Shree Krishna, helped the Pandavs win the battle. As mentioned earlier, King Yayati helped the Devgans during the battle with Devasurs. The pleased Indra had offered Yayati a divya-charriot as a gift for his help. Many centuries later, Jarasandh got the same charriot as a privilege of being Janmeyjaya, son of King Kuru. However, Shree Krishna obtained the same later on by power. King Yayati became tired of ruling the vast territories from Prayag to Mid-States. Therefore, during his older days, he took off to the forests and eventually became a monk. The prince of King Yayati, Yadu was a self respecting and a very established ruler. He had four sons. They were: Prince Sashtrajeet, Kroshta, Nal and Ripu. The kings between Rishi Buddh and Yayati were known as Somvanshi. As mentioned before, Yadu had officially lost the title to govern by his father's command since he had refused to exchange his youth with his father. Thereby, he could not have carried on the same dynasty, called Somvanshi. Notably, the only remaining dynasty of King Puru was entitled to be known as Somvanshi. Thereby King Yadu ordered that the future generations of his would be known as "Yadu" or "Yadav" and the dynasty would be known as "Yaduvanshi". The generations of Yadu had an unprecedented growth and got divided into two branches. King Sashtrajeet's generation came to be known as "Haihai Yadav" occupying the northern regions whereas the King Kroshta's generation became to be known as "Kroshta Yadav' occupying southern regions. King Haihai was Satajeet's son and Sashtrajeet's grandson. King Sashtrajeet instituted a new state and a new dynasty and offered the same, by his own will and against his birth right, to be taken care of by his younger brother Kroshta. Thereby, Kroshta officially became the heer of King Yadu. Consequently, the generations of King Puru, Paurav or Puruvanshi were the only ones to be known as Somvanshi. The Aryas who established the businesses in Kathiavad regions from Kurushetra, Surseni, Indrapasth etc, continued this approach of economy in later times as well. Rig Veda: 6.45.1 ya anayat paravatah suniti turvashu yadu'm. Indrasya sah nah yuvam sakha. Rig Veda: 1.174.9;6.10.12. pra yat samudram ati shur parshi paraya turvasha yadu swasti. Rig Veda: 4.30.17, ut tya turvashayadu asnatara sachipati-ah. Indra vidwan aparayat. Rig Veda: 8.7.18, yen av-ah turvasam yadu'm yen kadvam dhansptam. Raye su tasya dhemahi. After King Yadu, his second son, prince Kroshta acquired the kingdom and became the first Yaduvanshi ruler. His generations became to be known as "Kroshta Yadav"
13. King Sashibindu-A powerful King after King Chitrarath. In Sashibindu's leadership, the Kroshta Yadavs won the states from King Puru's dynasty in addition to some part of land from his brother Druhu's estates. He was from the same timeline as King Mandhata, the great grand father of king Dashrath and Ram. Shashibindu's daughter, Bindumati was married to Mandhata, however, they were great enemies. King Mandhata won the Kanyakubj from Anu's dynasty along with parts of land from Pauravs and Druhavs. The King of Druhavs, Gandhar, fled to what is now known as Afganistan and took shelter there. Later on, this same place was named Gandhar. Sashibindu, in an endless mode to acquire more land, created several problems in the states of Pauravs, Anuvs and Druhavs , resulting in higly unstable states. Therefore, all the lands from the generations of King Yayati and his second wife, Queen Sharmistha:Puru, Anu and Druhu - were acquired by King Sahibindu and King Mandhata. Due to the rise of Kroshta Yadav King Sashibindu, - the Haihai Yadavs had a wrong impact on society as well. Under the leadership of King Arjun Kirtivirya ( Sahastrabahu ), the Haihai Yadavs forced the Bhargav Bramhins of Narmada River to leave Kanyakubj and attain shelter in Ayodhya. Hahai Yadav King named Arjuna (not Pandava Arjuna), had thousand arms. He had propitiated Lord Dattatreya and has secured from his boons which made him invincible. But Arjuna misused his powers and became a merciless Tyrant. To end his Tyrant and all such evil Kshatriyas, Lord Vishnu came to earth as Parashurama, the youngest son of Sage Jamadagni and his wife Renuka. He had four brothers. Parashurama was very powerful and was unparallel in austerity as well as in strength. 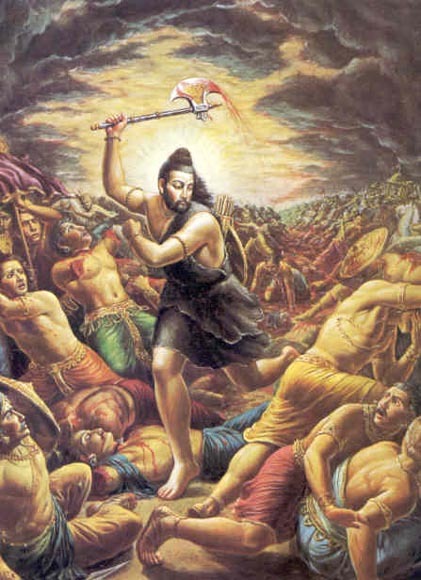 Though a Brahmin son Parashurama had inordinate love for weapons and his favorite weapon was the Axe. Sage Jamadagni had an Ashrama in the forests where he educated his sons and his disciples. Once when Parashurama & his brothers were away , Arjuna entered Jamadagni's Ashrama . Jamadagni and Renuka were alone in the Ashrama at that time. Jamadagni greeted him and offered him with delicious dishes and with the tasty milk of his cow Kamadhenu and her calf .The king pondered, "How did the sage get such a large quantity of food in this small Ashrama?" He later on learnt that it was because of Kamadhenu. He than thought to himself that " If Kamadhenu can feed so many people in such a short time then I must possess her." After the meals he took rest for a while and at the time of departure he ordered his men to seize the cow & her calf & take them to the Capital. The Haihai took the Kamdhenu cow of Rishi Jamdagni by force. This was the primary cause of the enimity between Haihai Yadavs and Bramhins. Under the leadership of Parshuram, son of the Rishi Jamdagni, the Bramhins attacked the Kshatriyas twenty one times. Every time, the kshatriyas lost. Therefore, they accepted the defeat as their ill fate and the Bramhins over took the ruling. During the Bramhin ruling, the Vaishyas and Sudras became troublesome broke away from the established caste system. Teasing and harassing Bramhin ladies became a normal act. Due to the lack of peace and law and order, the high caste society became highly sensitive and unstable from the lower caste. During these tough times, by the advise of Rishi Kashyap and other Rishis, King Vidurth – a Puruvanshi - overtook the ruling and brought back the peace to the Bramhins from the lower caste. Established the southern state of Vidharbh. He had three sons named Krath, Kaushik and Rompad. One of the decendants of Rompad was called Chedi. He established the states of Chedi, which is now known as Chanderi. 25. King Darshah, whose generations were called as "Darshah Yadav". During his rule, Yadavs had become very powerful. The generations of King Madhu, known as "Madhu Yadav" or "Madhav" ruled from the South-Western states of Gujarat to Northern states of Yamuna River. He had six sons named Princes Bhajan, Bhajman, Divya, Devvardh, Andhak, Mahabhoj and Vrashni. The dynasties of Satvatta, Andhak and Vrishni were known as "Satvatta Yadav", "Andhak Mahabhoj Yadav" and "Vrishni Yadav" respectively. King Satvatta was from the same time period as King Ram of Ayodha. After Lord Ram disappeared, the Ayodha Kingdom lost its prestige. In a few generations, the states of Yadavs and Pauravs excelled and took the lead. The Yadavs mainly had four states of which Andhak and Vrishni were most significant. King Andhak's state was in Mathura and had two sons, Prince Kukur and Bhajman. The generations of Kukur were Drashnu, Kapot-Rome, Devatta Viloman, Nal, Abhijit, Punarvasu and Ahuk. Ahuk had two sons, Devak and Ugrasen. Devak's daughter, Devaki was married to King Vasudev and gave us Lord Shree Krishna. Ugrasen, King of Mathura had a son named Kans, who by force, dethroned his father from his kingdom and became the new king. Furthermore, Kans locked his father Ugrasen, cousin sister Devki and Vasudev in jail. The king of Magadh state, Jarasandh was Kans's father in law. Shree Krishna killed Kans and returned the kingdom back to Ugrasen. Later on, Jarasandh was killed by Bhim. King Bhajman's generations included Vidurth, Rajdhidev, Shur, Shodashav, Shami, Pratikshrat, and Hridayak. Hridayak had five sons named Kritvarma, Darvah, Devrath, Shatdhanva and Devgarbh. The eldest son of Hridayak, Prince Kritvarma, in spite of being a Bhojvanshi, took Kauravs side during the great battle of Mahabharat. His younger brother, Shatdhanva killed Shatrajeet, a Vrashni Yadav as well as father of Shree Krishna's Queen Satyabhama. Retroactively, Shree Krishna killed Shatdhanva. 42. King Vrashni-King Vrashni had three sons named Sumitra, Yudhajeet and Devmudh. The generations of Yudhajeet were Satyaki, Prasen and Shatrajeet (killed by Shatd hanva,as mentioned in 41). The father of Prince Vasudev and Princess Pratha. Pratha was an adopted daughter of King Kuntibhoj, and in time to come, she was known as the famous Kunti. 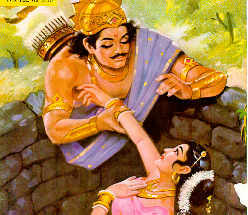 Kunti was married to King Pandu with whom she gave three key players of Mahabharat, Princes Yudhishtir, Bhim and Arjun. Madri, the sister of Madradesh King Shalv, was the second wife of King Pandu and gave the remaining two Pandavs, Princes Nakul and Sahdev. The second daughter of King Sursen, named Shrutvata, was the mother of King Shishupal of Chedi state. The second son of King Sursen was Devbhag and his son was Uddhav. King Vasudev was brother of Kunti and their father was King Surasen. King Vasudev had two queens. Queen Rohini, mother of Shree Balram and Queen Devaki, mother of Shree Krishna. Queen Rohini was daugther of King Prateep and Sunanda. King Prateep, a Puruvanshi (King Kuru's dynasty) was from Hastinapur. Shree Balram was an avatar of Sheshnag whereas Shree Krishna is the Supreme Personality of Godhead. He is the source of everything. The Supreme Lord Himself! Lord Krishna appeared in this world on 19th July 3228 BC (or 8th day of the dark half of the month of sravan or in Rohini Nakshatra, 8, 63,874 years 4 months 20 days of Dwapar Yuga). Shree Krishna married Princess Rukmani, the daughter of King Bhishmak of Vidarbh state. She was the mother of Pradumna and Goddess Laxmi Herself. Lord Krishna manifested His earthly pastimes for 125 years. He returned to Spiritual world on 18th Feburary 3102 BC and this is the date of the start of Kaliyuga- the current age (millennium which lasts for 4,32,000 years). 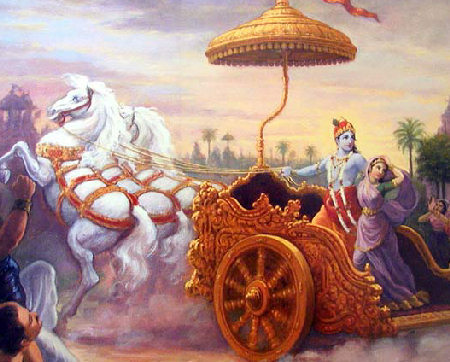 Lord Krishna spoke Bhagavat Gita when He was 90 years. He spent 3 years 4 months in Gokul, 3 years 4 months in Vrindavan, 3 years 4 months in nandagram, 18 years and 4 months in Dwarka and 96 years and 8 months in Dwarka. Shree Krishna married eight queens. 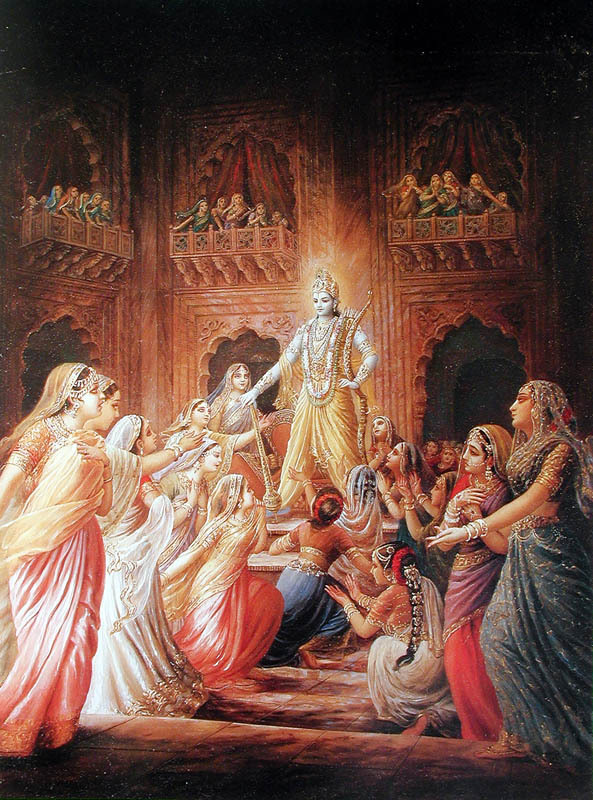 Later on Krishna rescued 16, 100 princess from the captivity of one demon. These entire princessess requested Krishna to marry them. Lord Krishna obliged them and married to all of them. He expanded Himself into 16,108 and used to live simoultaneouslly with all of them in 16,108 palaces in Dwarka. Each wife on average has 10 sons. Rukamni: The daughter of King Bhishmak of Kananpur. They had nine sons and one daughter. Prince Pradumgn, Sucharu, Chakbhadra, Sadasva, Hasva, Chargupta, Charuk, Charuhas and Princess Charukhasti. Satyabhhabha (A Yadav princess): The daughter of King Shatrajeet Yadav. They had seven sons. Prince Bhanu, Bhimrath, Khad, Rohit, Diptiman, Tambrandh and Jalandham. Mantra Vranda: The daughter of Mantra Vrand. They had three sons. Prince Sumitra, Charumitra and Mitravind. Satya: The daughter of King Satyajeet. Lakshmana: The daughter of King Mandra. Jamvanti: The daughter of King Jamvan. They had a son named Samb. Bhadra: The daughter of King Bhadrasen. Lord Shree Krishna used to rule the state of Surseni from Mathura having killed His maternal uncle Kamsa- the King of Andhak. Jarasandh, a powerful ruler of Puruvansh, happened to be father in law of Kansa. 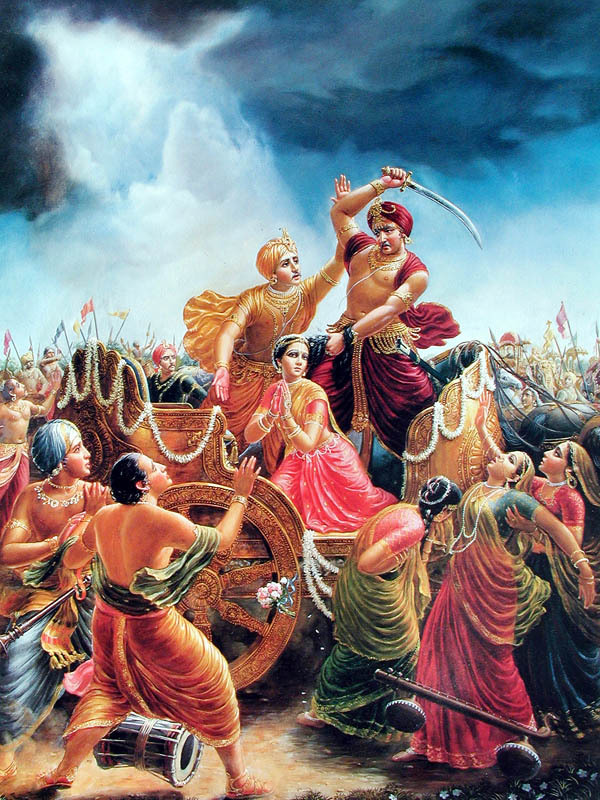 Jarasandh attacked Mathura 17 times in revenge of Kansa death by Shree Krishna and was defeated every time and was very insecure and was very angry and envious to Lord Krishna. Lord Krishna decided to shift His Kingdom from Mathura to Gujarat(Saurashtra, Kathiavad, Sindh) and made Dwarka as His capital. The various generations of Yadu were ruling many different parts of the Bharatvarsh. Amongst them, the major ones were Sattavatt, Bhoj, Haihai, Chedi, Vidharbh, and Vrishni. Shree Krishna was leading these Yadu Kings as a "Bhoj". After ruling for 18 years and 4 months from Mathura, Lord Shree Krishna later moved the capital from Mathura to Dwarika of Kathiavad. Dwarika was also known as Dwarvati, Jagatkoot and Kushsthali. Dwarika is situated at the far most frontier of the western frontiers. Lord Krishna ruled from Dwarka for 96 years. The decision of changing capitals by Shree Krishna had many advantages to his kingdom. The change reduced the possibility of any major wars with Jarasandh as there was a great natural boundary to cross, the Thar Desert. Secondly, the move also proved helpful in controlling the Arabs and Kings of nearby regions of Kathiavad, such as Sauveer and Sindh. Additionally, business trade with other countries of Indian Ocean and Atlantic was more profitable. Afterwards, the Yadavs of Dwarika established much closer ties with the generations of Anu and Druhu of Gandhar (Afganistan) state. Third, further promotion of Vaishnav philosophies amongst western regions was made possible through these situational changes. The archeological findings in these regions do include temples and their remainings. Unfortunately, in later times, the Buddha dharma and Islamic religions reduced these established remnants of Yaduvanshi's in these regions. Multan was known by many other names such as Kashyappur, Haspur, Bhagpur, Sambhalpur, and Prahladpur. Kashyappur was established by Kashyap, father of Aditya ( Suryadev). Father of Prahlad, King Hirankashyap was from the dynasty of "Daitya", or devils. Shree Krishna, defeated the grandson of Hiranyakashyap, Banasur and gave the state of Sindh-Multan to his son, Samb. Prince Samb was suffering with leprosy due to a curse by Rishi Durvasa. Thus, he could not stay inside the palace of Multan, but stayed outside in a garden instead. Shree Krishna requested Garud to ask the Ayurvedists of Shakdweep to find a cure for Prince Samb. The Ayurvedists told Prince Samb to pray to Lord Suryadev in order to find a cure for his predicament. Prince Samb acknowledged the same and got cured. Thereafter, he made a marvelous temple for Suryadev in the city of Multan. This temple was known for offering prayers to Lord Suryadev and patients of leprosy from all corners used to come here and obtain the Lord's blessings. Lord Shree Krishna's grandson and son of Pradhyumna, Prince Anirudh was married to daughter of King Banasur or Multan, Princess Usha. They had a son named Mrigketan. Yet another son of Banasur was Kou Bhand, who had a daughter named Ramaa. Thus, Usha was Ramaa's "bua". Once Ramaa had accompanied her bua Usha to Dwarika, Usha's sasural. Once arrived, Anirudh's Uncle, Sambh got attracted towards Ramaa and married her. They had a son named Ushneek or Ushaneer. Prince Kou Bhand became King after Banasur. But since he had no son, he called up Ushneek and make him the King of Sonitpur, the capital of Mistra. Many centuries later, one of the generations of King Ushneek, Devendra lost the kingdom to Nabi Mohammad and as a result his son, Prince Ugrasen was forced to convert to Islam. Prince Ugrasen was also known as Asvapati. Devendra's second son, Prince Gajpati came to Surat and established his own state. Gajpati's generations were known as "Chudasiya Yadavs". Devendra's third son defeated Firozshah in Gazni and ruled thereafter. Devendra's fourth son ruled the states of Kacch and Sindh. It is interesting to note exactly how the "Hindu" word could have come into existence. The Arabic people used to refer those living on the eastern province of Sindhu river Sindhu’s. But since in Arabic language they pronounce “S” as “H”, it became Hindu. So in real sense there is no religion called Hindu. This is the word coined by Arab’s to refer to the people living after the Sindhu River. Actually the dharma of all followers of Vedic literature is” Sanatan Dharma”. The aforementioned texts do symbolize that "Hindu" word is a mixed derivation of "Yadu" and "Yahudi". Furthermore, what about "Christ" and "Christian", which resembles so closely to "Krishna”? This is indicative of the fact that the establishment of Yadhuvanshis in the western regions for a long period of time and their subsequent amalgamation into their religion and culture (Islamic and Judaism), carries some weight in supporting similar sounding words in both languages. Mahabharat was based on a wide, joint Bharat varsh, which means the whole world. Ayravrat, is referred to the whole world. After the terrible years of Mahabharata, everything was decadent. The aftermath of the great battle was so mammoth that for a few centuries to come, history stood still with no life. In this long stretch of time, there was no major event to be noted by the historians. It is said that this phase of history was stagnant until the rise of Gautam and Mahavir. After the end of the Mahabharata war, the infuriated Gandhari, Queen of Hastinapur, remarked to Shree Krishna that if He wanted, the war could have been prevented even after the failure of the peace talks. According to her, Shree Krishna that He was very well aware of the results of the war and in spite of this, he encouraged the war between the Kauravs and Pandavs. Her extreme grief over her sons made her blame Shree Krishna for the end of her "kul" or death of all of her sons. She cursed Him that as He failed to stop the war between the Pandavs and the Kauravs by all means, similarly, His Yaduvansh would suffer and perish in the next 36 years. As per scriptures and the ancient historical texts, after the end of the Mahabharat war, Rishi Vishwamitra and Narad Muni came to Dwarika. 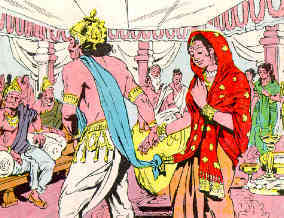 The Yadav princess, in order to trick the rishis, wrapped Samb with cloth and took him to the rishis for their blessings so that he could beget a son. The rishis were already aware of this by their sheer knowledge and cursed him instead. The curse was that during Bharya time, the Sambh, turned into a lady, would beget a "moosal" (type of weapon), which in turn would be used by the Andhak, Vrishni and other Yaduvanshi to kill each other. Lord Balram and Lord Shree Krishna would disappear right then the way they came from the Spiritual world. Lord Shree Krishna had knowledge of this curse and, thus, requested the Yaduvanshis to leave Dwarika right away and go for a pilgrimage to Prabhas (now known as Somnath, situated at the sea of Kathiavad, also known as yadu-sthal). He also told them to stay away from alcoholic beverages during their trip. Despite His warnings, The Andhak, Vrishni and the rest of the Yaduvanshis stopped for a break on their route to Prabhas and did consume alcoholic beverages. By now, the curse of the rishis came into effect and Sambh gave birth to a "moosal". In order to reduce its effect, they crushed the moosal or the iron club into “burada” or powder and sprayed it all around their camps. The drunken Vrishni, Satyaki, called upon Andhak Bhoj, Kritvarma. Pradhumgn supported this move of Satyaki. The main cause of their anger was the fact that in spite of being a Yadav, Kritvarma had helped the Kauravs during Mahabharat. Furthermore, after the Mahabharat, Kritvarma had sided with Aswathama, who broke war rules and had attacked the the sons of Pandavs while they were asleep. 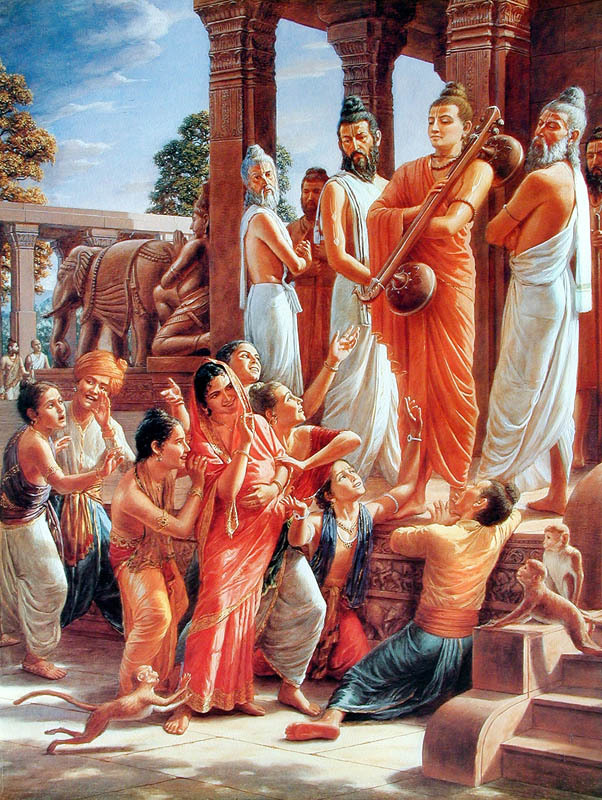 The intoxicated Satyaki got hold of a sword somehow and beheaded Kritvarma along with many others. This act had a ripple effect and other Andhak and Bhoj Yadavs called upon Satyaki in revenge and killed him along with Pradhumgn. By this act, the Yadus in war were polarized in two sides. 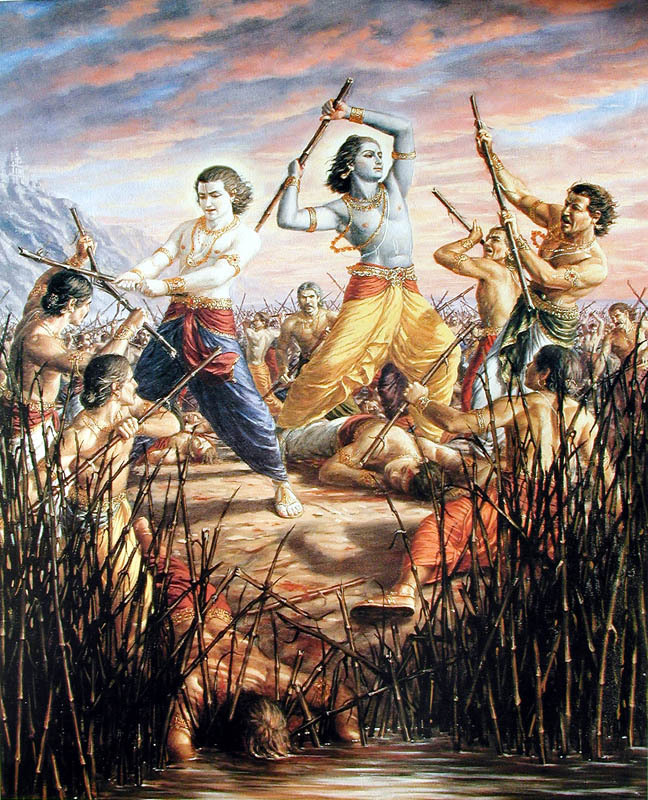 Shree Krishna became angry by the death of his son, Pradhyumna When He could not find any arms, He pulled out the nearby grass and trees which turned into "moosal" (watch the rishis curse here) through which He crushed many of his opponents. Following Shree Krishna, the armless Andhak and the rest of Yaduvanshis also started pulling out plants and grasses which turned into steel moosals. By this act of madness, Sambh, Charudesan and Anirudh all got killed. When Lord Shree Krishna saw His sons and grandsons getting killed, called upon his Sudarshana Chakra. Everything was finished within blink of an eye. Thus, the war amongst Yaduvanshis had begun and soon many died at the home front. This war ran for some period of time in which there was no differentiation between wrong and right. All sorts of weapons and techniques were used. When there were no remains of weapons, the Yaduvanshis took on rocks, lathis, gadas etc. This was intolerable to Shree Krishna and Balram. The remaining Yadhuvanshis having realized their mistakes started looking for Shree Krishna and Balram. They found Balram under a tree in deep meditation. Soon after, there came a white snake from his mouth and escaped towards Arabian Sea after which Balram ji returned to the the Spiritual abode. This story reaffirms the fact that Balram was an avatar of Shesh Naag. Well, it was about time for Gandhari's curse to come into play. Shree Krishna, cognizant of all this, went to the forests and slept under a tree. From one of camps of Kaboos, Jara was following a deer as his prey. From distance, he mistook Shree Krishna's left foot for the deer's ear and shot arrows right on. When he came to claim his prey, he realized the mistake he had committed and began asking for Lord's forgiveness. Shree Krishna, while forgiving Jara Kaboo, explained that in their previous lives, He as Lord Ram had killed him as Bali while hiding behind a tree. 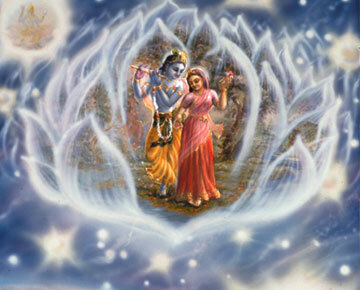 Soon after, Shree Krishna became quiet and He returned to the Spiritual world. Lord Shri Krishna is the Supreme Personality of Godhead and He appeared on earth to protect His devotees and to eliminate the troublemakers and evil people. After finishing His lila He returned to His Spiritual abode where He lives and performes beautiful pastimes with His devotees. All His Yadav associates, who has taken birth on earth to assist and partake in the divine lila of the Supreme personality of Godhead Krishna, returned to their respective place in swargaloka and in the spiritual world. After these terrible times, Arjun performed the dahya-sanaskar of Balram, Shree Krishna and other Yaduvanshi in Prabhas. Upon his return from Prabhas to Dwarika, Arjun brought together the widows, kids and old men and women and built protected camps for them. Afterwards, he started moving the camps to Mathura. As soon as he crossed the border of Dwarika, the city of Dwarika submerged in the sea along with the remains of its ancestors. The archeological findings have recovered many remains from Dwarika. When Arjun crossed into the ranges of Ahirvati and Abhirvati of Northern Rajasthan and Hariyana, the local Abhirs attacked Arjun and the remaining Yaduvanshi. They kidnapped young widows, women and kids. Seeing this, the remaining old women and men requested Arjun to protect their kids from Abhirs. However, Arjuna knew their fate. He could see their future in Mathura and could not use any force. It was apparent that none of the Abhirs could have sustained Arjuna's Gandiv. However, he could not use force even against his own will. Mighty Arjuna understood that without the will of the Supreme Personality of Godhead Shri Krishna, he is just like a puppet. Having heard the sad news of return of Balram and Shree Krishna to the Spiritual Abode, and internal fight amongst Yaduvanshis, the son of Pradhyumna, Vrijnabh, of Mathura took off to Dwarika from Mathura. On the way, when he heard of the death of his father, he could not bear the pain and died of a heart attack. He had two sons with him at the same time of which the elder, Vraj, returned to Mathura and became the new King while the younger Kheer, went to Dwarika. The Ahirs of Mathura and Braja regions were known to be peace loving cowherds whereas the Abhirs of Hariyana and Mahendraghad, who later on became to be called as Ahirs, were powerful and accomplished warriors. The generations from the kidnapped women or widows were known as Yaduvanshis. However, the ones with Abhir fathers became to be known as Yadavs. Out of these Yadavs, many have been categorized into backward classes whereas the rest of them are flourishing farmers in Hariyana, Uttar Pradesh and Bihar states. King Hanspat of Hisar city was the 76th Yaduvanshi King after Shree Krishna as per Bharat calander. Accordingly, King Hanspat was born roughly 2520 years after Shree Krishna.